1. Drain and pat dry all canned ingredients. 2. Chop pepper, garlic and anchovies 3. Pre-heat the oven to 190C/170C Fan/Gas 5. Grease an ovenproof dish and a sheet of foil large enough to cover it. Cook the pasta for 2 minutes, then drain. 4. Fry the onion in the oil until soft. Add the garlic and red pepper and cook for 3 minutes over a low heat. 5. Add the chopped tomatoes, chilli flakes, tomato purée, sweet chilli sauce and 4 tbsp water. Heat until simmering. 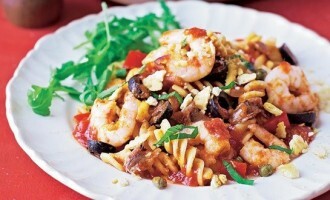 Add the pasta, anchovies, olives, capers, basil and prawns. 6. Remove from the heat and add to the prepared dish. Cover with the foil and cook in the oven for 10 minutes. Remove the foil. Crush the crackers and sprinkle them on top, then cook for a further 10 minutes.